Click on the T-shirt, to customize! This t-shirt is available in other styles and colors too, for both men and women. 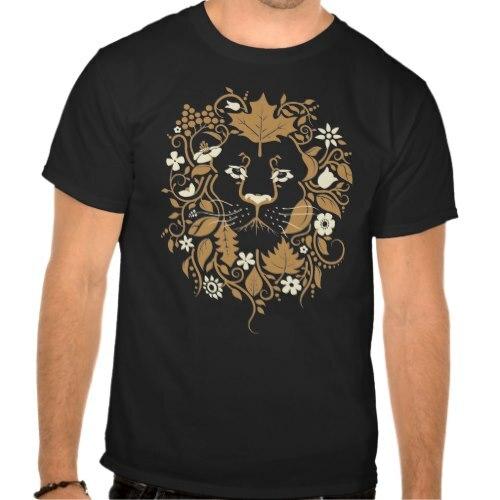 It features an awesome two color design, containing illustrations of various plant life that make up a face of a lion. A cool shirt, for both men and women. Makes a great gift for you! Makes a unique birthday or christmas gift, for friends and family, the people you love! Also a great gift for plant and animal lovers, wildlife conservationists, nature lovers. Great gift for Earth Day, and for those who are passionate about Save the Earth, protecting the forests and the animal habitats.